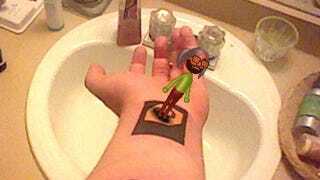 IHeartChaos' Cranberryzero was so impressed with the Nintendo 3DS augmented reality cards that he decided to have one permanently stabbed into his skin. What could be better than this augmented reality tattoo? I have a few suggestions. Since the release of the Nintendo 3DS, people have been putting images of its augmented reality cards everywhere, from t-shirts to the sides of buildings, all for the sake of making Nintendo characters and games pop up in bizarre places. This was only a matter of time. Luckily for CBZ the tattoo AR card works like a champ, though there is at least one easily remedied problem. Right now, the tattoo doesn't always work in really bright light, like sunlight, but it works fine in dim-ish light. I think I need to go back and get an outline around it, because I think the 3DS is looking for the edge of the card and can't find it in bright light. In the manual, it says to never obscure the white border around the card when you're using the 3DS, something I didn't notice til later. You can see it in shaky action via the YouTube clip, demonstrating one of the key ways I feel this tattoo could be improved upon. Don't put it on your arm. In order to play the augmented reality games on Nintendo's 3DS, you ideally want both hands free, something that's hard to do when the image you have to focus on is on one of those hands. My suggestion? Have it placed on your upper leg, just above your knee. That way wearing shorts becomes a wonderland of Nintendo magic, and you can get two of them to keep things balanced. My other suggestion? Use one of the character cards instead. That way you are etching a permanent love letter to a Nintendo character on your body, and that's never a bad thing, plus you can put them in creative places for maximum effect. I'll leave those places up to your imagination.